Why the long face? I hear you ask. 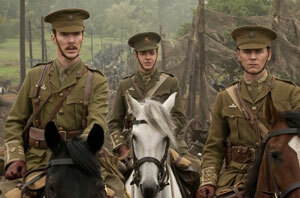 Well, I loved Michael Morpurgo's book War Horse. Aimed at older children, it tells the tale of a noble English horse's war time experiences in a heartfelt yet unsentimental, straightforward manner, and it moved me to tears. So I went into Steven Spielberg's big budget, big screen adaptation sponsored by Kleenex, expecting to sob myself silly. Not so. Because while there are moments in this over-long epic that caused my eyes to bulge, often this was not so much with weepiness as with sheer disbelief. 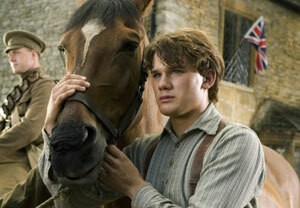 Joey the horse is raised by farm boy Albert Narracott (Jeremy Irvine) in a bucolic vision of turn of the century Devonshire, all green fields, ruthless landlords and comedy geese, more Babe than Birdsong. When the First World War breaks out, Albert's hopeless father (played by Peter Mullan and now equipped with a pedantic backstory to explain his erratic, alcoholic behaviour) sells Joey to one dapper Captain Nicholls (Tom Hiddleston). And so, an hour later than expected, begins Joey's ordeal in France. Yet having been lulled into a semi-coma by the opening scenes of rural sub-Thomas Hardy ooh-arr shenanigans, we're suddenly thrown, like poor Joey, into the mire and melée of World War One. I sincerely hope no horses were harmed in the scenes of equine carnage that follow because, while the intro may make Postman Pat look like The Wire, no punches are pulled when it comes to depicting the horror of war. Passed from pillar to post, across enemy lines and back again, Joey pulls ambulance carts, aids an escape and toils to pull heavy artillery through knee-deep mud at the side of his doomed horsy friend, Topthorne, all the while touching the lives of everyone he encounters – before, this being the First World War they die, mostly. In the stand-out scene of the movie, the moment that makes it all worthwhile, we see a Geordie Tommy and his German counterpart meet on no-man's land to rescue our remarkable horse from a hideous tangle of barbed wire. This beautiful sequence perfectly encapsulates the humour and simplicity of the book, which otherwise gets lost in a slew of Spielbergian schmaltz as sucky as the Flanders mud. Because everything that is mawkish and cheesy about this film is a new addition, from the miraculous reappearance of Farmer Narracott's Boer war pennant to the 'hoot like an owl and I'll come for you' reunion between horse and boy to the lurid tangerine Gone with the Wind sunset as the pair return to 'Devon' (oops, spoiler). And, worse, we are clearly not to be trusted to feel happy and sad in the right places without a huge swell of overwrought strings and mood appropriate weather to tells us whether to laugh or cry. And this, well, this annoys me. So a red rosette for Joey the horse for giving Uggie the dog a run for his money in the animal acting stakes, and indeed to the rest of the fine British cast (and A Prophet's Niels Arestrup) who struggle manfully (and womanfully, in the case of Emily Watson) to waft away the stench of stilton with their masterful acting chops. And shame on Steven Spielberg, for not crediting his audience with more heart. If the entire film had lived up to the standard of the barbed wire scene, it would have been a masterpiece. But as it is, it's part gold, part... horsesh*t.